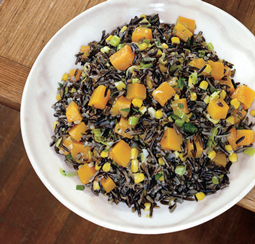 Wild Rice with Butternut Squash - A recipe from Savor California, the online showcase for extraordinary gourmet foods and beverages from California. Recipe by Nancy Oakes and Pamela Mazzola for Bon Appétit Magazine. Photo by Tim Morris Photographer. Oil rimmed baking sheet. Toss squash cubes and 3 tablespoons oil in medium bowl. Spread squash in single layer on prepared sheet; sprinkle with salt and pepper. Roast squash just until tender but firm enough to hold shape, stirring occasionally, about 15 minutes. Transfer squash to bowl. Cool. Melt 4 tablespoons butter in large skillet over medium heat. Add leeks and 3/4 cup water; simmer until leeks are tender, about 7 minutes. Add corn; simmer 2 minutes longer. Separate rice grains. Add rice and butternut squash; simmer until heated through and liquid is absorbed, about 4 minutes. Stir in 2 tablespoons butter and parsley. Season with salt and pepper.